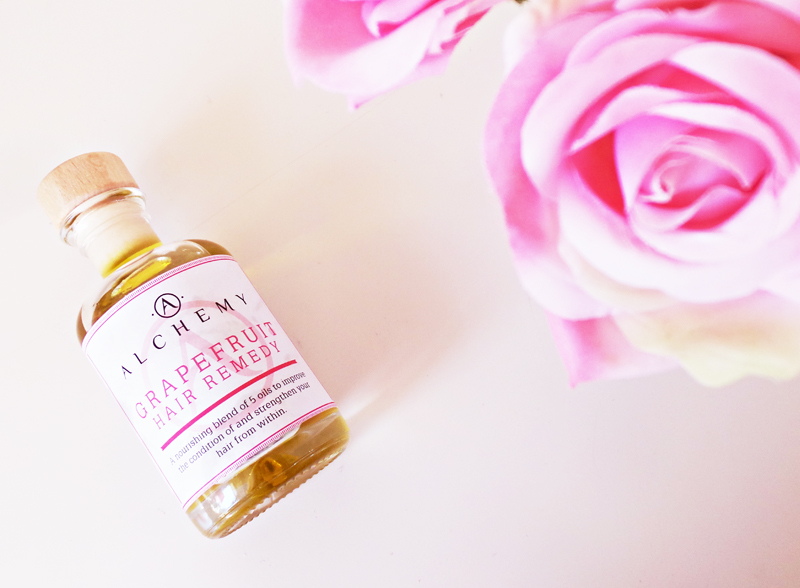 The Grapefruit Hair Remedy appears to be the only product available to buy from Alchemy Oils website at the moment. I'm guessing the reason for this is that they believe so strongly in the qualities and results of this product that this is all you'd need. The remedy contains a blend of 5 super oils, which claims to improve the condition of your hair and strengthen from within. The product arrived well protected in a cardboard box and wrapped in a gorgeous hot pink paper. Upon opening this I found this lovely little glass bottle with wooden cork stopper. It kind of reminds me of something out of the Harry Potter films in a potions class... very unique and clever packaging design - Alchemy Oils! The remedy has a deep honey-like colour to it, but has a fruity fresh scent. The remedy can be used on all hair types and colours! Yes, you heard me, all hair types... fine, thick, damaged, dry, curly, straight, afro and even oily/greasy hair as the product actually helps to regulate oil production.. so it won't make your hair any more oily. 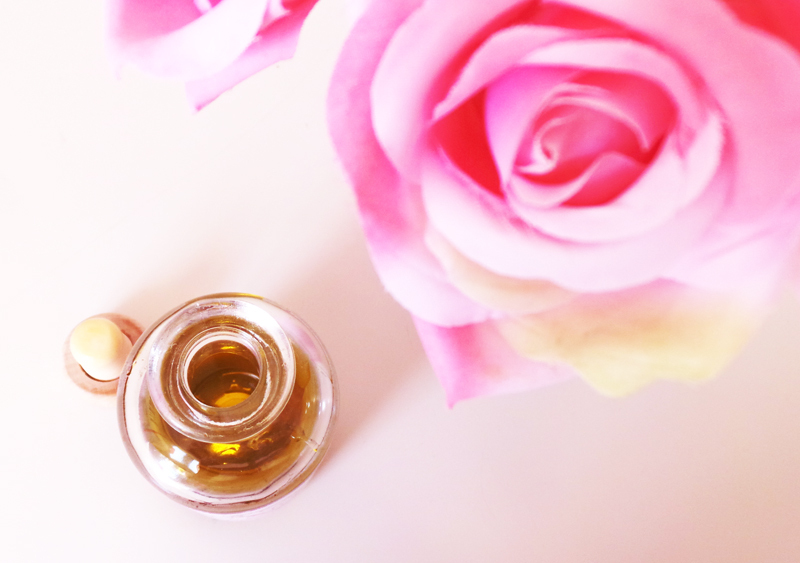 The formula contains 5 super oils, which are: Coconut, Avocado, Almond, Castor and finally the main ingredient Grapefruit Oil. Each has it's own individual natural properties which work in sync together to promote hair growth, thicken your hair, and leave it with a lustrous, healthy looking shine! The Grapefruit Oil also helps to fight against dandruff and keep your scalp healthy. It is recommended that you apply the product to damp hair, by massaging a few drops of the oil directly into your scalp. You should then leave on for a minimum of 20 minutes for it to work its magic. I decided to apply when I was having a lazy sunday, and left it on pretty much all day wrapped in a turbie towel, before rinsing and shampooing out on the evening. I was happy to see that the product didn't leave a greasy residue, but it did leave my hair feeling luxuriously soft, smooth, shiny and smelling gorgeous - the scent literally lasted for days! If your hair is frizz-prone, you can apply a tiny bit of oil through the mid-ends of your hair before blow-drying to smooth out any flyaways. Although this might seem a little pricey, the100ml bottle will last a long time as you only need a few drops at a time to massage into your scalp, maybe once or twice a week. The product is completely natural, no SLS or harmful parabens. It is blended with the 5 most effective super oils so there is no need for anything to be added or taken away, and allows your hair to absorb everything it needs to be strong and healthy! Here are some useful images which I've taken from the Alchemy website, to explain the properties and benefits of each of the ingredients in more detail. Enjoy! Thanks for sharing this with me! This is the kind of product I have been searching for! I have just got this and I am enjoying it so far! This oil looks fab, I have frizzy hair so I bet this would work wonders for my hair. Perfect that it doesn't leave a greasy residue either, I hate it when hair oils do that. Cute bottle too - it does remind me of something off harry potter too.